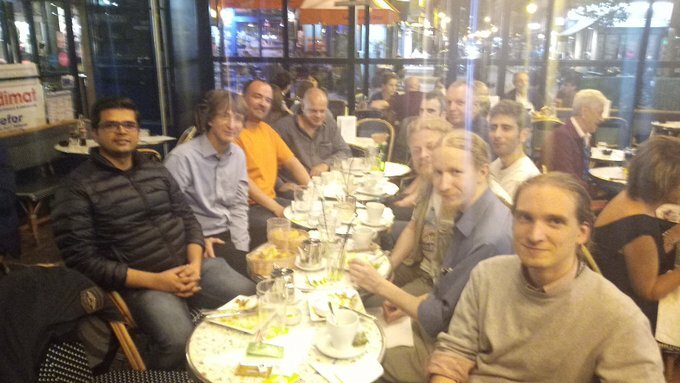 This year the annual EuroBSDcon event took place in Paris (September 21st-24th). There were BSD summits, tutorials and talks, including NetBSD & pkgsrc ones. NetBSD on Google Compute Engine - by bsiegert. During the closing ceremony there was a speech by Alistair Crooks on behalf of The NetBSD Foundation. Resume porting tsan and msan to NetBSD with a plan to switch back to the LLDB porting. Let me tell you about my experience at EuroBSDcon 2017 in Paris, France. We will see what was presented during the NetBSD developer summit on Friday and then we will give a look to all of the NetBSD and pkgsrc presentations given during the conference session on Saturday and Sunday. Of course, a lot of fun also happened on the "hall track", the several breaks during the conference and the dinners we had together with other *BSD developers and community! This is difficult to describe and I will try to just share some part of that with photographs that we have taken. I can just say that it was a really beautiful experience, I had a great time with others and, after coming back home... ...I miss all of that! So, if you have never been in any BSD conferences I strongly suggest you to go to the next ones, so please stay tuned via NetBSD Events. Being there this is probably the only way to understand these feelings! Arriving in Paris via a night train from Italy I literally sleep-walked through Paris getting lost again and again. 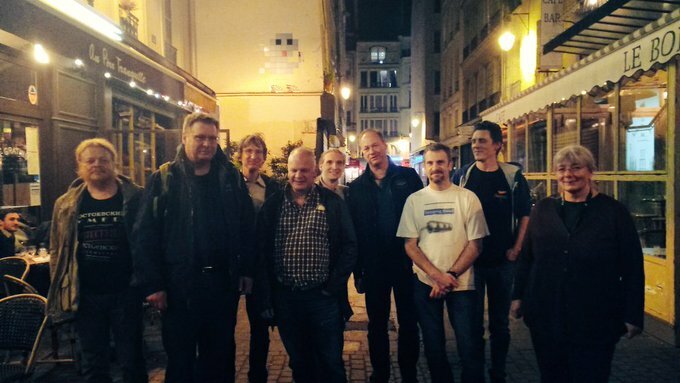 After getting in touch with other developers we had a dinner together and went sightseeing for a^Wseveral beers! On Friday morning we met for the NetBSD developers summit kindly hosted by Arolla. From left to right: alnsn, sborrill; abhinav; uwe and leot; christos, cherry, ast and bsiegert; martin and khorben. The devsummit was moderated by Jörg (joerg) and organized by Jean-Yves (jym). After a self-presentation the devsummit presentations session started with the talk presented by Benny (bsiegert) about NetBSD on Google Compute Engine. Benny first introduced Google Compute Engine (GCE) and then started describing how to run NetBSD on it. The .tar.gz image then just need to be uploaded to a Cloud Storage bucket, create a GCE image from it and then launch VMs based on that image. He also discussed about GCE instance metadata, several problems founds and how they were fixed (it's better to use NetBSD 8_BETA or -current!) and some future works. For more information slides (PDF) of the talk are also available. Valery (uwe) presented a talk about Scripting DDB with Forth. It was based on a long story and actually the first discussion about it appeared on tech-kern@ mailing list in his Scripting DDB in Forth? thread (ddb(4) is the NetBSD in-kernel debugger). If you are more interested in this presentation I strongly suggest to also give a look to uwe's forth Mercurial repository. The third presentation of the devsummit was a presentation about the recent work done by Jörg (joerg) in the VCS conversions. Jörg started the presentation discussing about the infrastructure used for the CVS -> Fossil -> Git conversion and CVS -> Fossil -> Mercurial conversion. It's worth also noticing that the Mercurial conversion is fully integrated and is regularly pushed to Bitbucket and src repository pushed some scalability limits to Bitbucket! Mercurial performance were also compared to the Git ones in details for several operations. A check list that compared the current status of the NetBSD VCS migration to the FreeBSD VCS wiki one was described and then Jörg discussed the pending work and answered several questions in the Q&A. For more information please give a look to the joerg's presentation slides (HTML). If you would like to help for the VCS migration please also get in touch with him! After the lunch we had several non-scheduled discussions, some time for hacking, etc. We then had a nice dinner together (it was in a restaurant with a very nice waiter who always shouted after every order or after accidently dropping and crashing dishes!, yeah! That's probably a bit weird but I liked that attitude! and then did some sightseeing and had a beer together. From left to right: uwe, bad, ast, leot, martin, abhinav, sborrill, alnsn, spz. From left to right: uwe, bad, ast, christos, leot, martin, sborrill, alnsn, spz. Abhinav (abhinav) presented his work on the new spell(1) implementation he's working (that isn't just a spell replacement but also a library that can be used by other programs!). He described the current limitations of old spell(1) (to get an idea please give a look to bin/48684), described the project goals of the new spell(1), additions to /usr/share/dict/words, digged a bit in the implementation and discussed several algorithms used and then provided a performance comparison with other popular free software spell checkers (aspell, hunspell and ispell). He also showed an interactive demo of the new spell(1) in-action integrated with a shell for auto-completion and spell check. If you would like to try it please give a look to nbspell Git repository that contains the code and dicts for the new spell(1)! Video recording (YouTube) of the talk and slides (PDF) are also available! Cherry (cherry) presented recent work done with Santhosh N. Raju (fox) about uvm_hotplug(9). The talk covered most "behind the scenes" work: how TDD (test driven development) was used, how uvm_hotplug(9) was designed and implemented (with comparisons to the old implementation), interesting edge cases during the development and how atf(7) was used to do performance testing. It was very interesting to learn how Cherry and Santhosh worked on that and on the conclusion Cherry pointed out the importance of using existing Software Engineering techniques in Systems Programming. Video recording (YouTube) and slides (PDF) of the talk are also available! Pierre (khorben) presented a talk about recent pkgsrc security features added in the recent months (and most of them also active on the just released pkgsrc-2017Q3!). He first introduced how security management and releng is handled in pkgsrc, how to use pkg_admin(1) fetch-pkg-vulnerabilities and audit commands, etc. 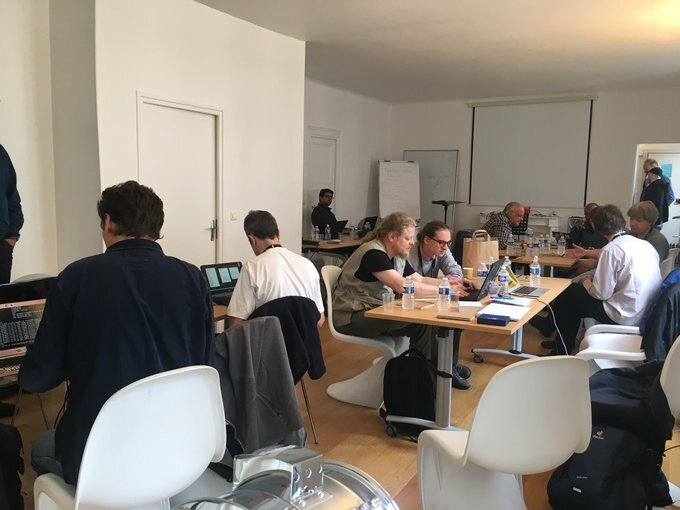 Challenges for each hardening features and future works were discussed. For more information video recording (YouTube) and slides (PDF) of the talk are available. A good introduction and reference for all pkgsrc hardening features is the Hardening packages wiki page. Christos (christos) presented the work about reproducible builds on NetBSD. In his talk he first provided a rationale about reproducible builds (to learn more please give a look to reproducible-builds.org! ), he then discussed about the NetBSD (cross) build process, the current status and build variations that are done in the tests.reproducible-builds.org build machines. Then he provided and described several sources of difference that were present in non-reproducible builds, like file-system timestamps, parallel builds headaches due directory/build order, path normalization, etc. For each of them he also discussed in details how these problems were solved in NetBSD. Video recording (YouTube) of Christos' talk is available. Apart the resources discussed above a nice introduction to reproducible builds in NetBSD is also the NetBSD fully reproducible builds blog post written by Christos last February! The social event on Saturday evening took place on a boat that cruised on the Seine river. 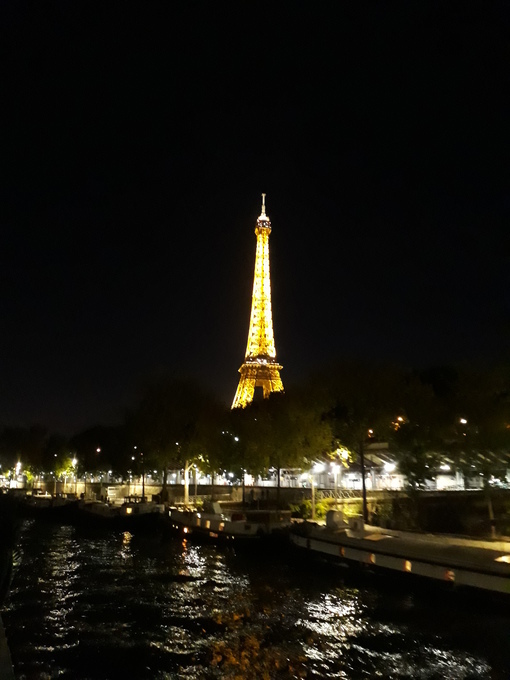 It was a very nice and different way to sightsee Paris, eat and enjoy some drinks and socialize and discuss with other developers and community. Sevan (sevan) presented a talk about several notes and lessons learnt whilst running tutorials to introduce NetBSD at several events (OSHUG #46 and OSHUG #57 and #58) and experiences from past events (Chiphack 2013). He described problems a user may experience and how NetBSD was introduced, in particular trying to avoid the steep learning curve involved when experimenting with operating systems as a first step, exploring documentation/source code, cross-building, scripting in high-level programming languages (Lua) and directly prototyping and getting pragmatic via rump. Video recording (YouTube) of Sevan's talk and slides (HTML) are available. Kamil (kamil) presented a talk about the recent LLDB debugger and a lot of other related debuggers (but also non-strictly-related-to-debugging!) works he's doing in the last months. He first introduced debugging concepts in general, provided several examples and then he started discussing LLDB porting to NetBSD. He then discussed about ptrace(2) and other introspection interfaces, the several improvements done and tests added for ptrace(2) in atf(7). He also discussed about tracking LLDB's trunk (if you are more curious please give a look to wip/llvm-git, wip/clang-git, wip/lldb-git packages in pkgsrc-wip!) and about LLVM sanitizers and their current status in NetBSD. In the conclusion he also discussed various TODOs in these areas. Video recording (YouTube) and slides (HTML) of Kamil's talk are available. Kamil also regularly write status update blog posts on blog.NetBSD.org and tech-toolchain@ mailing list, so please stay tuned! Alistair (agc) presented a talk about what we will see in NetBSD 8.0. He discussed about new hardware supported (really "new", not new "old" hardware! Of course also support for VAXstation 4000 TURBOchannel USB and GPIO is actually new hardware as well! :)), LLVM/Clang, virtualization, PGP signing, updated utilities in NetBSD, new networking features (e.g. bouyer's sockcan implementation), u-boot, dtrace(1), improvements and new ports testing, reproducible builds, FDT (Flattened Device Tree) and a lot of other news! The entire presentation was done using the Socratic method (Q&A) and it was very interactive and nice! Video recording (YouTube) and slides (PDF) of Alistair's talk are available. 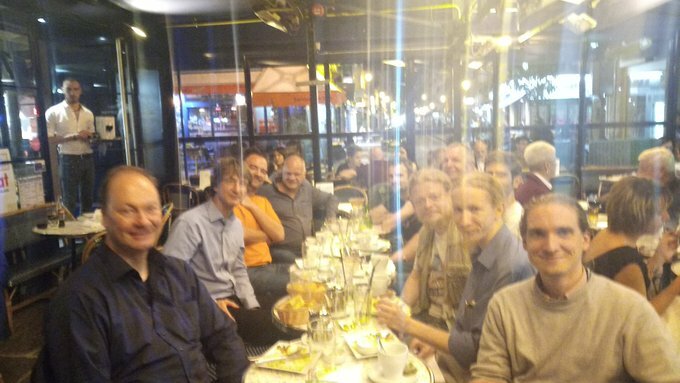 After the conference we did some sightseeing in Paris, had a dinner together and then enjoyed some beers! It was a very nice weekend and conference. It is worth to mention that EuroBSDcon 2017 was the biggest BSD conference (more than 300 people attended it!). 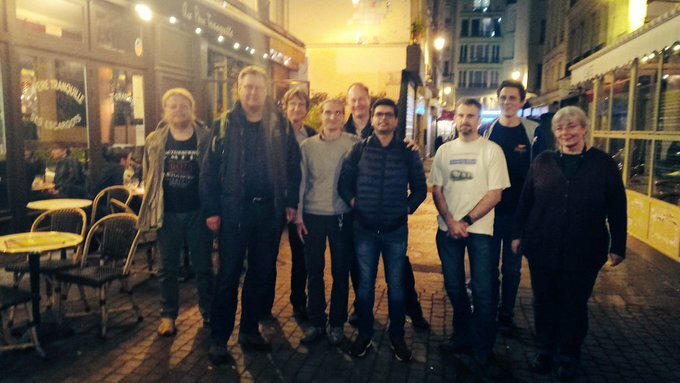 I would like to thank the entire EuroBSDcon organising committee (Baptiste Daroussin, Antoine Jacoutot, Jean-Sébastien Pédron and Jean-Yves Migeon), EuroBSDcon programme commitee (Antoine Jacoutot, Lars Engels, Ollivier Robert, Sevan Janiyan, Jörg Sonnenberger, Jasper Lievisse Adriaanse and Janne Johansson) and EuroBSDcon Foundation for organizing such a wonderful conference! I also would like to thank the speakers for presenting very interesting talks, all developers and community that attended the NetBSD devsummit and conference, in particular Jean-Yves and Jörg, for organizing and moderating the devsummit and Arolla that kindly hosted us for the NetBSD devsummit! A special thanks also to Abhinav (abhinav) and Martin (martin) for photographs and locals Jean-Yves (jym) and Stoned (seb) for helping us in not get lost in Paris' rues! Recently, I completed a Kernel ASLR implementation for NetBSD-amd64, making NetBSD the first BSD system to support such a feature. Simply said, KASLR is a feature that randomizes the location of the kernel in memory, making it harder to exploit several classes of vulnerabilities, both locally (privilege escalations) and remotely (remote code executions). The current design is based on a specialized kernel called the "prekern", which operates between the bootloader and the kernel itself. The kernel is compiled as a raw library with the GENERIC_KASLR configuration file, while the prekern is compiled as a static binary. When the machine boots, the bootloader jumps into the prekern. The prekern relocates the kernel at a random virtual address (VA), and jumps into it. Finally, the kernel performs some cleanup, and executes normally. Currently, the kernel is randomized as a single block. That is to say, a random VA is chosen, and the kernel text->rodata->data sections are mapped contiguously starting from there. It has several drawbacks, but it's a first shot. To complete this implementation, work had to be done at three levels: the bootloader, the prekern and the kernel. I committed several of the kernel and bootloader patches discreetly a few months ago, to pave some way for real changes. In the past few weeks, I changed the low-level x86 layer of the kernel and replaced several hard-coded (and sometimes magic) values by variables, in such a way that the kernel can run with a non-static memory layout. Finally, the last step was committing the prekern itself to the source tree. Randomize the kernel sections independently, and intertwine them. Modify several kernel entry points not to leak kernel addresses to userland. Randomize the kernel heap too (which is still static for now). Fix a few other things that need some more work. All of the patches are now in NetBSD-current. Instructions on how to install and use this implementation can be found here; they are inlined below, and probably won't change in the future. The system will boot with no further user interaction. Should you encounter any regression or unexpected behavior, please report it immediately to tech-kern. This KASLR implementation will be available starting from NetBSD 9. Once it is stabilized, it may be backported to NetBSD 8. Until then, feel free to test it! Congratulations to the students for finishing their projects successfully, and thanks to Google for sponsoring!